Home Lifestyle	5 Latest Trending Balloon Decoration Ideas for Your Party! What does a party signify? It is an ultimate space for fun and happiness. It is of course temporary. This is the reason why it is more intriguing and intense. A party does not last long but the essence of the quality time can be longer than the time it lasts. Party is the transparent reflection of celebration. We all love to cherish life by celebrating each moment. So, even in our busy lives, we love to find time to enjoy small achievements. The decor is an intricate part of parties. Decoration always brings in the mood of parties. Talking about props, one cheap yet incredible party decor is the balloons. They are available in varieties of quality and designs to fir in your party. Balloons have been one conventional and common prop of any party decorations. But the ways of using balloons are changing and they are growing unique as well. One such amazing idea is this balloon photo frame. The concept of having a photo booth with a balloon wall in the background is a trendy decorating idea. If this is a birthday party, you can print a wall-size photo of him/her and can paste it on the wall. Then make a colorful border with various balloons. You can also keep the idea the same for someone close’s anniversary or wedding by replacing the pictures. Besides a wall of small pictures with balloon border can also make a great balloon photo frame theme. The balloon is a good choice to decorate the walls and ceiling of your party hall. It becomes very useful when you have a theme for your party. You might have chosen the Silver or Golden as the theme color and design of your party. 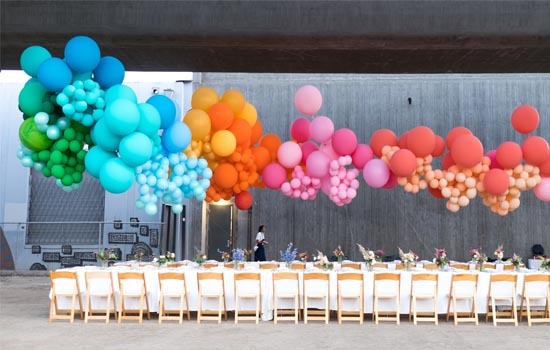 Then the backdrop of the room will look perfect with such contrasting color balloons. If it is a wedding, then the backdrop of the vow-stage will look gorgeous in balloons. In any party, if you planning for fall ceiling, the helium balloons are perfect. This is one of the best balloons decoration ideas ever. 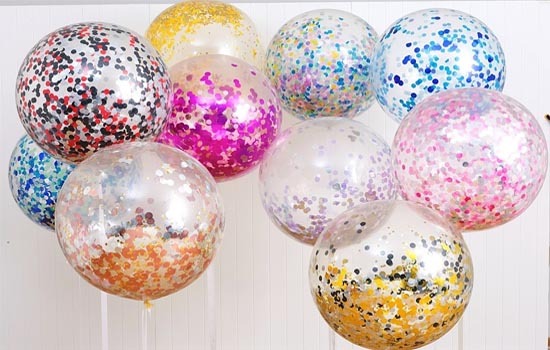 Balloon and confetti are the two most special combinations for party decor. Confetti is strip papers of various colors. If you are planning to make a creative lighting with balloons, then these two will be of great help. Put a glow sticks inside the inflated balloons. Then hang them on the walls. To make them look more attractive, you can hang the confetti from the strings of the balloons. Again, you can make other different designs as well. You can stick different color confetti on the surface of the inflated balloon. The lighting that will reflect from the inside glow stick will make unique patterns. The patterns depend on the cutting and pasting of the confetti on the balloons. 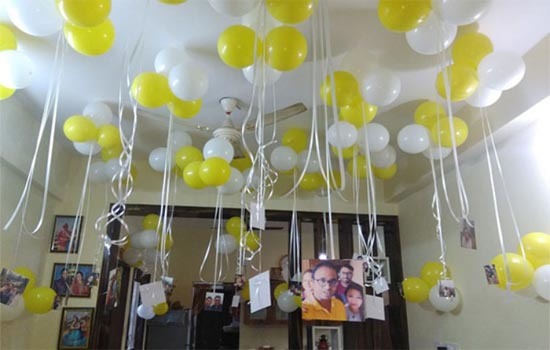 A birthday party for him/her can have this idea as the best decorating idea for party ever. Use balloons to make it grand and unique one. First, have the picture of the birthday boy/girl you would choose to make a portrait. Then fix the number of balloons you need to make it. Then on each piece of balloon, paint the part of the pictures. It will be more like a puzzle that will constitute the whole picture. The plan sounds very interesting but is it risky as well. Misplacement of even one piece of the balloon will ruin the whole idea. But if you can execute the plan in an exact way, it can be the biggest birthday gift ever. The foil balloons is a little old school but they are trendy as well. These balloons are best with the person on this special day. The character foil balloons are the most favorite ones. 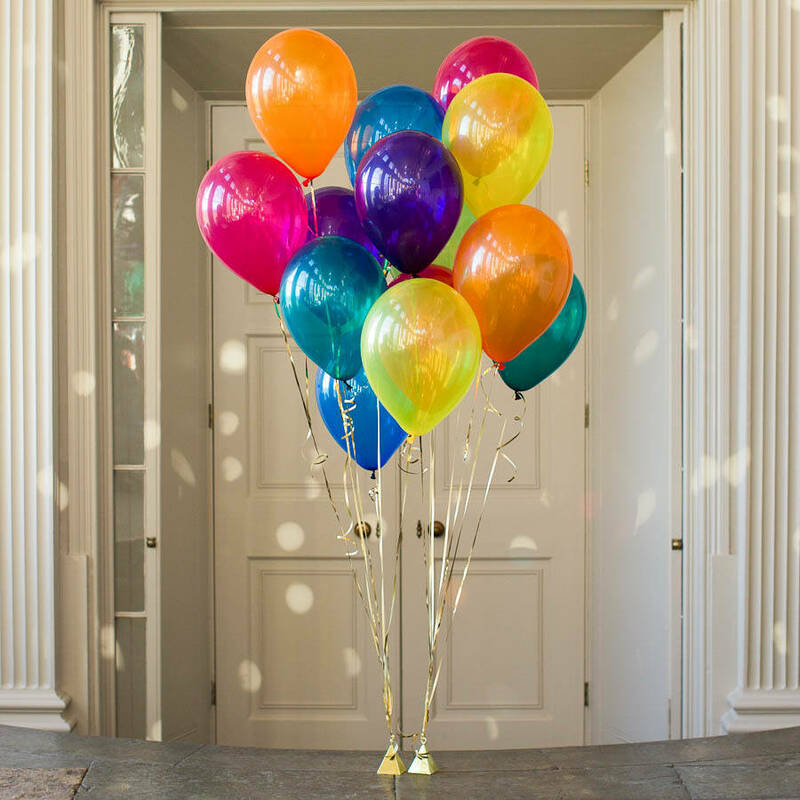 These balloon decorations look best at the entrance of the party hall as a welcoming note. 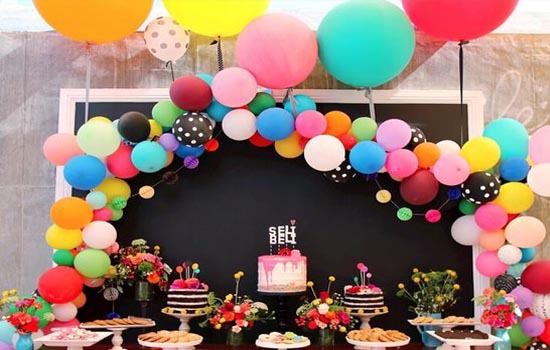 Such an idea of balloon decor becomes perfect when you throw the party for someone close. You can get those foil balloons from any balloon bouquet delivery sites. The above is the best balloon decor ideas that can make your party the grandest. Hope you try it for your next party and make it memorable.